There’s no shortage of information out there on school readiness. 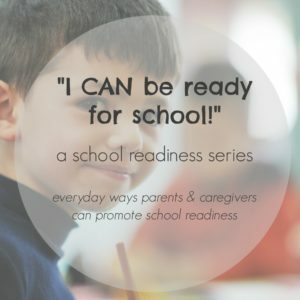 It’s an important mission and we’ve enjoyed sharing posts and lists over the summer months to equip parents and caregivers as they prepare their rising kindergarteners for the transition of school. Get FREE tips, fresh content, & event news! I CAN be ready for school! Your donation can make a huge impact in the lives of Pickens County children. Check back soon for information about how to donate, or call 864-654-3000. 3 Simple Ways for Busy Parents to Make Books Part of Everyday Life! © 2019 Pickens County First Steps. All Rights Reserved. Powered by WordPress.